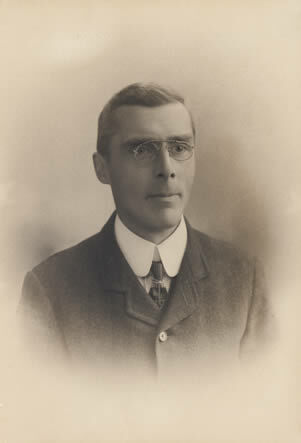 Born in Birmingham in 1871 he was educated at King Edward’s Grammar School, Aston, and Mason University College, Birmingham (later Birmingham University) where he gained London University External degrees of BA in 1890, and MA in Modern Languages in 1893 (for which he was Prizeman in English and First in the List in Modern Languages). His first position was as Lecturer on English and Literature at Mason University College, 1891 – 1898, and this was followed by five years as Principal, Victoria Institute, Worcester 1898 – 1903. He was appointed Director of Education for Leicestershire in 1903 and serving to his retirement at the age of 76 in 1947, Sir William Brockington was one of the most influential figures in English education throughout the first half of the 20th century, (e.g. member of the Burnham Committee 1919 – 1947, of the Consultative Committee of the Board of Education, 1926 – 1944, and of the Hadow Committees on Primary (1931) and Infant/Nursery (1933) educational reform, and the Spens Committee (1938) which set the pattern for the 1944 fundamental reform of secondary education. His professional activities included periods as President and Honorary Treasurer of the Association of Directors and Secretaries for Education. Within Leicestershire he began reforming the system of elementary schools and incorporating the then independent grammar schools into the County education system, while developing further and higher technical, arts and teacher training education at the Loughborough College (now the University of Loughborough). Rejected for military service in 1914 he turned to supporting the munitions effort through training and production at the County Council’s Loughborough Technical Institute which he had established in 1909 as what became the first part of the Loughborough College. Nevertheless from 1916 to 1919 Brockington commanded the 2nd Volunteer Brigade of the Leicestershire Regiment, and he was also very active with the educational support of war refugees in Leicestershire (particularly Belgians in World War I – in recognition of which he was awarded Belgium’s Médaille du Roi Albert avec Rayure in 1920, and then Polish refugees in World War II). His many local positions included those of President of the Lit and Phil for 1909 – 1910, and serving as regional chairman of the YMCA. His 1917 OBE, was followed by a CBE in 1928, and he was made a Knight Bachelor in 1946. Publications: Brockington’s many publications included a number of books, notably: Elements of Military Education (1916), The Little Bible: Selections for Schools and Parents (1931 and numerous subsequent editions – the royalties from which were used to fund much of the county’s pioneering arts in education initiatives under both Brockington and his successor Stuart Mason), and The Future of Post-Primary Education (1935). Biographies: Brockington, William Allport Who’s Who in Leicestershire (Worcester: Bayliss); M. Seaborne, ‘Sir William Brockington, Director of Education for Leicestershire, 1903–1947’, Leicestershire Archaeological and Historical Society Transactions, vol. 43 (1967–8), pp. 45–59), M. Seaborne, ‘William Brockington, Director of Education for Leicestershire, 1903–1947’, pp. 195 – 224 in B. Simon (Editor) Education in Leicestershire, 1540–1940, (1968), D. K. Jones, Brockington, Sir William Allport (1871–1959), educational administrator. Oxford Dictionary of National Biography (2004).